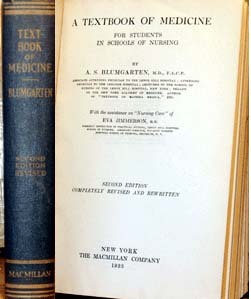 Blumgarten, A.S. A Textbook of Medicine for Students in Schools of Nursing, second edition, with index. New York: MacMillan, 1933, 662 pp. Size: 8.5" x 5.5" x 1.25"